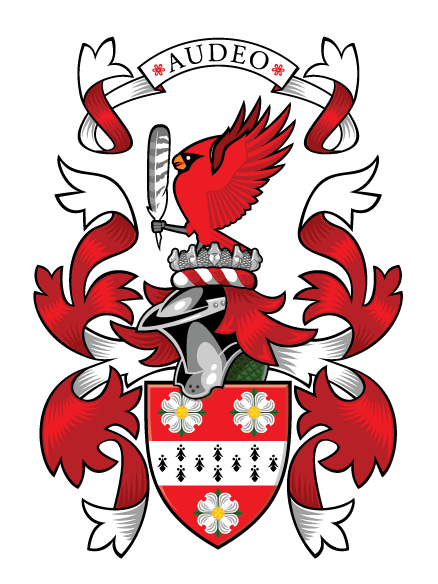 I’m now officially hanging my shingle as a heraldic designer for Americans who wish to assume their own arms. I’m also the designer for the Clan Crawford Association’s Armorial Project. The CCA appears to be the first clan association to establish this kind of independent heraldic register. Since the US has no regulating body for civilian heraldry, it’s important that Americans seeking to assume arms consult with people who know the rules and traditions of heraldry, and are able to bring them into a synthesis that is practical and relevant in an American context. Heraldry has been an interest of mine for almost forty years. I specialize in making emblems, badges, sigils, seals, bookmarks, coats of arms, and flags. When designing traditional coats of arms, I obey the principles of good heraldic design: proper usage of colors, simplicity of imagery, etc. My designs are bold and flat because they are symbols, not pictures. They are meant to be immediately recognized from a distance; that was their original purpose. I like to get a basic family background (country of origin, ethnicity, any heraldic traditions in the family) then get the individual bearer’s personal background (profession, interests, etc) and finally their aspirations or ideals, things that they find symbolically significant. I synthesize all three of these aspects and make emblems that are strong, simple, and lasting. Basic fee for designing a coat of arms is $300. It includes two rounds of revisions and two files: a JPEG for online use and a PDF for print use. Adapting artwork for a flag is $150 extra. All designs are owned entirely by the bearer, and are able to be resized to suit many uses. Again, I don’t just do heraldry: if shields and helmets aren’t your thing, and you want something more modern, I also design personal badges and flags. This entry was posted in Heraldry on November 16, 2016 by Allen Crawford.